Keep calories and sugar in check, without missing out on all the fun. Thanksgiving is the official kickoff to the holiday season – and more than a month filled with cocktail parties and family dinners … and the dreaded holiday weight gain that comes with them. While heavy seasonal dishes and an abundance of cookie trays are surely to blame, the cocktail you’re sipping on the side is adding some liquid calories to your tally that many people overlook. A cocktail can run you anywhere from 100 calories for a simple vodka-soda to over 300 calories for a holiday specialty like spiked eggnog. But it doesn’t seem that the empty calories are deterring us from imbibing: Thanksgiving, Christmas and New Year’s top the list for the highest grossing sales of wine and spirits. And according to the Distilled Spirits Council of the United States, a quarter of the $49-billion-a-year distilled spirits industry’s profits come from the month between Thanksgiving and the New Year. While keeping our consumption in check is important, that doesn’t mean you need to miss out on all the fun. Cassetty reminds us that the daily recommended intake for alcohol caps women at one drink per day and men at two. When you do choose to imbibe, reach for a cocktail that is low in added sugars and make it festive with these easy tricks. Ditch the egg nog. Try these four festive holiday drinks instead. If you’re hosting a cocktail party or holiday dinner, getting creative with your ice cubes is one way to keep the evening festive while cutting back on added sugars. Mixer cubes: “Making cocktail ice cubes keeps things festive and provides a punch of flavor so you can limit the sugary mix-ins,” says Cassetty. “100 percent fruit juice is naturally sweet — it doesn't contain any added sugar — so it's a healthier alternative to traditional cocktail mixers.” Simply freeze the juice of your choice into ice cube trays; once frozen, drop it into a glass, add liquor of choice, and top with club soda for a light and refreshing sip. Herbs and fruit: “Combining fresh fruit and herbs is another way to liven up your drink without ramping up your sugar intake,” says Cassetty. You can always drop them into the bottom of your glass and muddle them into your cocktail, but we prefer taking it a step further and freezing them into ice cubes. It adds a fun pop of color to your glass and will feel festive for your guests — and as they melt they infuse even more flavor into your drink! Plus, it’s a great way to use up leftover herbs that would otherwise get tossed. Simply rip herbs into small pieces and dice larger fruit like oranges or lemons (berries can remain whole), drop into an ice cube tray, fill to the top with water, and freeze. So watch out for added sugars and don’t go overboard at the open bar at your office holiday party — got it. But the holidays are a time for gathering and celebrating with those we love, and there’s nothing wrong with indulging a little on a festive sip. Cassetty’s philosophy is always “everything in moderation,” and when we do indulge, she encourages us to make it worth every bite (or sip). Be intentional about which splurges matter to you and then truly savor the full experience. Cassetty reminds us that one meal or sugary drink will never unravel consistently healthy eating habits. “But over the holidays, the trouble is that one meal leads into leftovers leads into a cookie swap and so on, so it's a good idea to be intentional about which splurges matter to you and then truly savor the full experience,” she says. To make the most of the drinks you do choose to enjoy — and seriously impress your guests — use these super simple tricks to elevate your cocktails (and your tablescape) without adding much prep time. Add a pop of flavor with glass rimmers. Crushed candy cane is a fun way to add a festive twist to holiday beverages (and a way to enjoy the flavor of the seasonal treat without eating a whole cane!). We also love mixing herbs like rosemary or thyme into salt rimmers for drinks like greyhounds or margaritas. Simply combine salt and herbs in a blender and pulse until combined. Then rim your glass with a lemon or lime wedge and dip into the rimmer to coat the egde of the glass. Wow your guests with an Ornamentini. We got this idea from Inspired by Charm, and it’s a showstopper. The best part? It looks so festive that guests will assume you spent way more time creating them than you actually did. (It will be our little secret that it only took five minutes of your time). To make: mix up your favorite cocktail (we suggest a red hue to keep it festive!). Remove the metal topper from a 3-inch glass ornament ball. Using a measuring cup with a pour spout or a funnel, pour the cocktail into the ornament. Replace the topper back on the ornament securely. 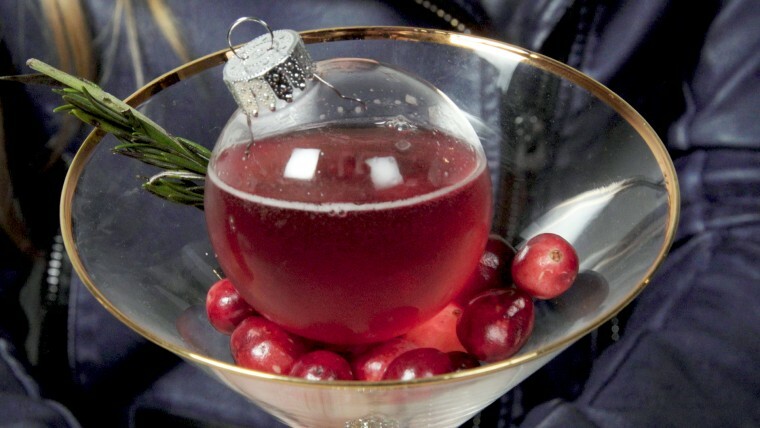 Then, place a handful of cranberries and a sprig of rosemary in the base of a martini glass, and nestle the ornament inside. Set an Ornamentini at each place setting – your guests will love the festive touch, and it will be a fun conversation starter (that is sure to get the party started) as they open the ornaments and pour their drinks into the glass!